On a journey through wooded areas, or even a woodpile out back, you can find some interesting things. Mushrooms can be interesting, but fungi are not exactly jumping around for our entertainment. They just sit there. One of these is called the fluted bird's nest, Cyathus striatus. This fungus is interesting because it does indeed resemble a bird's nest, eggs and all. Those ain't eggs, pilgrim, they contain the spores that spread them around. The action commences when a raindrop smacks into the "nests", and those egg-like things (peridioles) shoot out of their containers; they are shaped to use some of the impact force of the raindrop. With the help of sticky threads, they attack to whatever is nearby. If they get swallowed by some critter, no big deal: it all comes out in the end, if you catch my meaning. Of course, adherents of molecules-to-mycologist evolution give credit to Darwin. All hail, blessed be! Except there is no evolutionary mechanism or model, only blind faith. What we do see is further evidence of design by the Master Engineer, which is the rational conclusion. They are fungi, but you wouldn’t know it. They are only a few millimetres high, but contained within these minute hunks of life is a universe of fascination. They are cup-shaped, and contain a number of small, hard, lentil-shaped ‘eggs’ neatly arranged within. 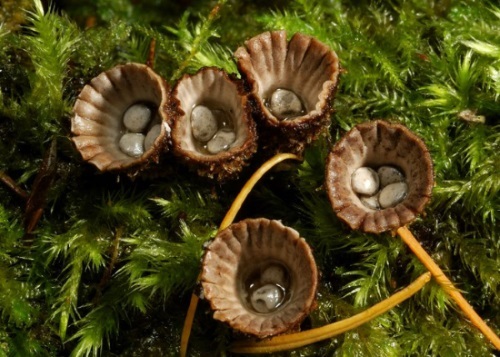 This is why they are called ‘birds-nest fungi’ (Cyathus striatus). Until 1790 they were thought to be flowering plants, the little ‘eggs’ being seeds. And it was not until 1951 that a man by the name of Brodie described how the ‘eggs’ fly from the nest. To read the entire article, click on "Splashing success".